What a staggering achievement: a must-buy and a must-read. Within these pages is a complete and kaleidoscopic vision of a far future utopia, and a master-class in world building by John C. Wright. Here, benevolent machine superintelligences called Sophotechs rule over an immortal and fabulously wealthy mankind. Humanity is divided only by their neuroform base and manorial schools. Face-to-face interaction is an artifact from the third Mental Structure; now, telepresence, is all-the-rage. Reality can be viewed, augmented, and enhanced via sense filters, synnoetic sensory channels, and alternate mentalities. Men can choose to appear as a Greek God, or a pillar of flame, or an armored penguin. Events can become super-charged with symbolic meaning, or experienced on a transcendental level of reality. And that’s not even the half of it. Wright’s vision of the future manages to be both alien and immensely sensual. The reader is invited into a ‘matrix’ of pleasurable distraction that’s like Google Glass on acid, times infinity. The level of imagination on display here may actually prove to be too dense in texture and too rich in taste for some. The first few chapters have a bewildering amount of weird words, foreign concepts, and all kinds of mythological and philosophical allusions. It was a time of masquerade. It was the eve of the High Transcendence, an event so solemn and significant that it could be held but once each thousand years, and folk of every name and iteration, phenotype, composition, consciousness and neuroform, from every school and era, had come to celebrate its coming, to welcome the transfiguration, and to prepare. No human or posthuman race of the Golden Oecumene was absent from these festivities. Fictional as well as actual personalities were invited. Composition-assisted reconstructions of dead or deleted paladins and sages, magnates and philosophers , walked by night the boulevards of the Aurelian palace-city, arm-in-arm with extrapolated demigoddesses from imagined superhuman futures, or languid-eyed lamia from morbid unrealized alternatives , and strolled or danced among the monuments and energy sculptures, fountains, dream fixtures, and phantasms, all beneath a silver, city-covered moon, larger than the moon past ages knew. And here and there, shining like stars on the active channels of the mentality, were recidivists who had returned from high transhuman states of mind, bringing back with them thought-shapes or mathematical constructions inexpressible in human words, haunted by memories of what the last Transcendence had accomplished, feverish with dreams of what the next might hold. It was a time of cheer. And yet, even in such golden days , there were those who would not be satisfied. Fortunately, there happens to be an interesting story that accompanies all this world-building. Our hero is Phaethon, a manor-born and important figure in society, and he is celebrating the thousand-year anniversary of the High Transcendence at his family mansion, alongside the rest of humanity. When he discovers that large parts of his memories have been erased, he sets out on an epic quest in search of his true identity, and to find out what great crime he committed against the Golden Oecumene that caused his memory wipe. The Golden Age is part one of a three-part trilogy, and I’m extremely eager to rejoin Phaethon on his journey for truth. “The Golden Age” Trilogy is like LOTR in that it’s really just one novel that’s been broken up into three. The comparisons you can make to LOTR don’t stop with just an accidence of publishing, as the “Big Bad” of the series would put Sauron the Great to shame. I recently finished the marvelous trilogy this book begins. It is a work of genius I feel privileged to have experienced. 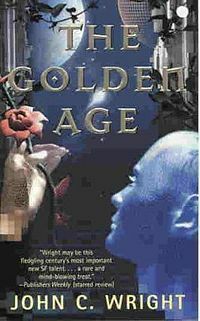 “The Golden Age” Trilogy is the most imaginative depiction of far-future technological development in both breadth and depth that I’ve read. Manifesting fictional persons, creating short-lived partials of yourself to do game-theory simulations, altering your neuroform, not to mention your body, for philosophical or aesthetic reasons, self-editing sense-filters that allow you to see or not see anything you like, the list goes on and on. And the plot and characters are pretty good as well. A sci fi story could be written about any one of the technologies in The Golden Age. I’d recommend it to anyone thinking of writing science fiction and anyone who Could dare to read it, though the density of the story can be a little daunting.